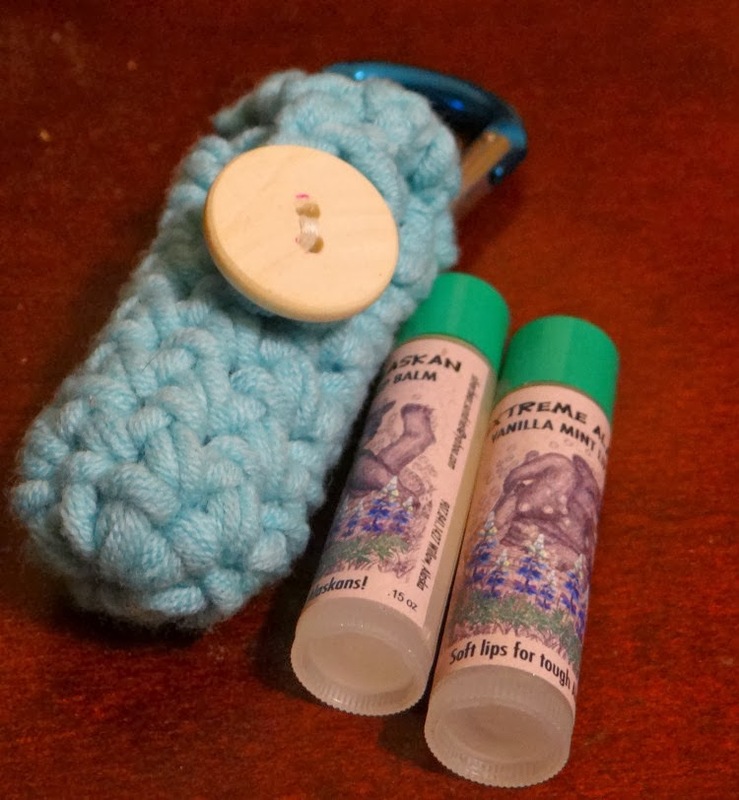 This lip balm cozy works up super fast to be a nice gift and features a 1 inch button and a carabiner clip to attach it to a bag or keyring. carabiner- this one is an inexpensive aluminum clip rated for 150 lbs and not to be used for climbing. I love single crochet! This is done in single crochet except for 2 stitches which are trebles to create a loop for the carabiner clip. dec sc= decrease single crochet; insert hook in first stitch, yo, pull loop through, leave on hook,(2 loops on hook) insert hook in next stitch, yarn over, pull loop through, yo, pull through the 3 loops on hook. Round 1: ch 1 (does not count as first stitch)- 8 sc in ring, sl st to join. Rounds 2-6: ch 1 (does not count as first stitch) sc in each stitch, sl st to join. Round 7: ch 1 (does not count as first stitch), sc in first stitch, tr in next 2 stitches, sc in next 5 stitches, sl st to join. Row 6: ch 8, sl st to join on row 5 stitch. Break off yarn and weave in ends. Use the embroidery floss to stitch the button in place to the front of the cozy so the loop fits over it. Slip carabiner clip under the two treble stitches. This is my husband's FAVORITE lip balm. The one he uses throughout the winter here in Alaska and that kept his lips from chapping last year when he was walking a half mile from his parking spot to his job last winter in the cold cold early hours. He likes a fair amount of tingle, and this peppermint/vanilla is just right. Not sweet, moisturizes well and full of good oils. You can find Silverbear Sundries HERE on Facebook.